I finally had the chance to try Adobo Connection last Saturday. That was before I did my grocery shopping. I’ve been meaning to visit this place since it opened in Robinsons Galleria, but Adobo Connection never seems to run out of customers. The place is always full, so I wasn’t able to have a sampling of their food offerings sooner. I prefer chicken over pork, and I love dishes with gata (coconut milk), so this is what I ordered. You can have all of their dishes as “Solo” or “Go Sulit.” Because it’s my first time, I opted for “Go Sulit.” For only Php125.00, you have a generous serving of chicken or pork adobo with soup and unlimited rice. Not bad! 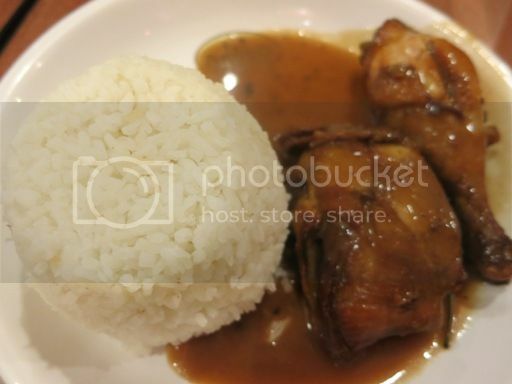 The first thing I noticed about this Chicken Adobo sa Gata was that the chicken parts were big. If you’re not a big eater, you can actually get a “Solo” order of this, then split the chicken parts between you and your companion. The rich coconut milk and the flavorful adobo sauce blended perfectly with a hint of sweetness. I loved this, but what I noticed when I was almost done eating was that there was a small portion of the chicken leg that needs more cooking. Other than that, the taste was okay. I ordered this for Justin’s yaya. Again, there’s a generous serving of pork here. The fried pork adobo was seasoned just right, but according to Justin’s yaya, there were pork pieces that were a little hard to chew. She finished all of it anyway with an extra serving of rice. I wanted vegetables with my meals, so I ordered one of their “Dagdag Sarap” dishes, the Gising-Gising. 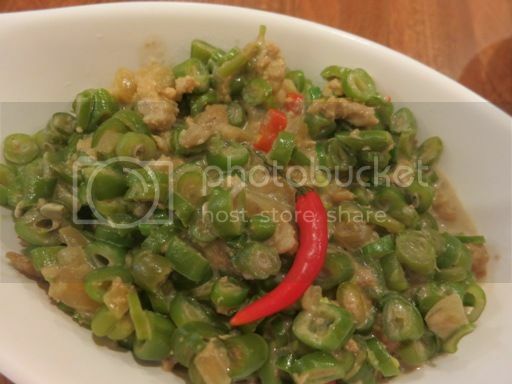 It’s a vegetable dish with ground pork and green beans (Baguio beans) and coconut milk. As the name suggests, this vegetable dish will literally wake you up because it’s spicy. I was glad I tried this because it was delicious. What’s not good is that this Gising-Gising made me eat more rice. Lol! I’d love to try their Fish and Tofu Adobo next time. Pinoys will surely enjoy eating here because the prices of their food are quite affordable. Aside from chicken, pork and fish adobo, they also have Sizzling Sisig and Beef Kare-Kare. They also offer side dishes like garlic rice, adobo rice, chicken sopas, gising-gising, kare-kareng gulay and fried egg. They also have “affordobo meals,” “meryenda specials” and desserts for pocket-friendly prices. 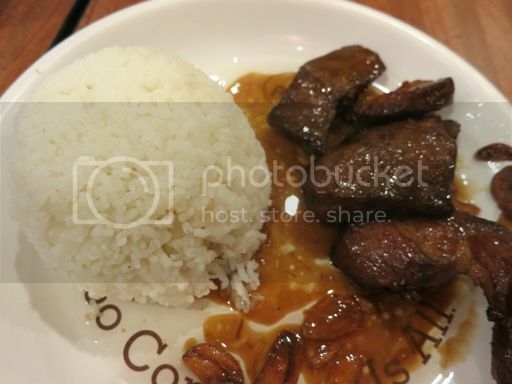 This entry was posted in Adobo Connection, Filipino Cuisine, Food Friday, Food Trip Friday, Restaurant Review, Robinsons Galleria. Bookmark the permalink. i think am going to love that place…have heard of them, too but haven’t had the chance. not yet. drooling here. lol. i see one of their branches near my office but haven’t tried it.